I feel the same way, I came across the news about Maddie from another blog I follow and found myself in tears reading about this family and their dedication to their daughter. The support they have received has been unbelievable! It amazes me that, through the internet, such powerful emotions can be created and embraced - sometimes without even knowing someone directly. I have volunteered with the March of Dimes in the past and found that the families, staff and community have an incredible network. I have been hooked ever since and I don't even have a child! Thank you so much for being such a wonderful supporter for the March of Dimes over the years. Maddie Spohr has been on our minds and the response to her death in the social media space has really been a testament to the families and babies we focus on here on a daily basis. As you mentioned we have been in the social media space for years now with online communities, blogs, Twitter, photo-sharing, video sharing and in personal spaces like Facebook and MySpace. I would like to try to address your questions. The key word here is community and the March of Dimes approach varies depending on the each of their needs. We listen first to the communities before rushing in. For example how we approach fundraising may be very different from our outreach to mission-affected families. 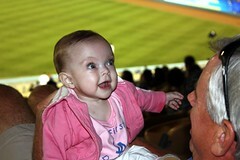 March for Babies.org is a team-building fundraising community with an active blog and Twitter stream. While families with a child in the NICU are supported by our Share Your Story online community through blogs, forums and message boards. Our News Moms Need blog was created to address the life stages of women of child-bearing age, from preconception through pregnancy to mom and baby. The well-trafficked Spanish language blog, one of the highlights of our social media outreach, offers pregnancy content in the readers’ preferred language. We have had Twitter accounts for 2 years delivering pregnancy and baby tips in both English and Spanish. We firmly believe in being relevant across the lifespan of our constituents and meeting people with our hands out in friendship; offering up specific content targeted to their life stage before soliciting their fiscal support. If by “this effort” you mean the incredible rallying around the Spohr’s; we did very little. Heather Spohr is a well-known mommy blogger and had just agreed to be one of the March of Dimes Moms in the weeks prior to her daughter’s death. She walked in March for Babies last year when her daughter was in the NICU and had set up her March for Babies team well before the untimely death of Maddie. She asked for donations to be sent to the March of Dimes. It was her strength and generosity that fueled the outpouring of support. Of course, we are in the blogging and Twitter space so we knew what was happening as it happened. We commented on blogs and tweeted out messages of support throughout the following days. We posted on our own blogs. We touched base internally and made the chapters aware of what was going on. Many of the people that supported Heather and Mike were also following us on Twitter. We are all part of the same community. Social media is integrated throughout the organization in almost every department from Education to Communication to Fundraising. There is a cross-functional team that meets regularly to discuss calls to action, new outreach opportunities, metrics and any hot topics. Blogging is done in teams and the various Twitter accounts are, for the most part, managed by the Pregnancy & Newborn Health Education Center. A hefty central how-to document was created to help the chapters weigh the pros and cons of engaging in social media for themselves. Senior management of the Foundation supports the use of social media which I think is critical to the success of any program especially one as varied as new media.